The informal Green Parliamentary Group visited Zasavica Special Nature Reserve on Thursday 11 April. Zasavica and its banks have been protected as a Special Nature Reserve since 1997. The visiting MPs attended part of a lecture and discussion on “The importance of protected natural resources and the state’s role in nature conservation” with a representative of the Provincial Institute for Nature Conservation. They also spoke about the importance of Zasavica and the development of sustainable tourism in Serbia with the Reservation Manager Slobodan Simic. Afterwards, the MPs were taken on a guided tour of the Reservation. MPs Nada Lazic, Jasmina Karanac, Branimir Jovanovic, Predrag Jelenkovic, Sonja Pavlovic, Jovan Jovanovic, Milija Miletic, Zarko Bogatinovic, Radoslav Cokic and Zoran Despotovic took part in the visit. 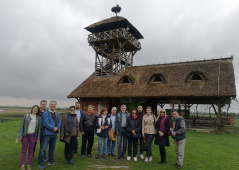 The realization of the visit was supported by the United Nations Development Programme (UNDP) in Serbia under the auspices of project “Strengthening capacities for the implementation of international environmental agreements” financed by the Global Environment Fund (GEF).